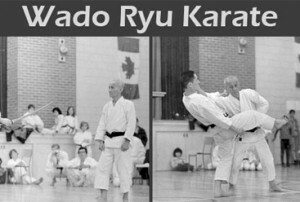 The name of the martial art form of wado ryu karate has originated from its original name which was Wado-Ryu Karate-Do. This exclusive style was developed by the famous Japanese martial arts leader Hironori Ohtsuka Sensei (1892 – 1982) in the year 1934. The meaning of the term Wado-Ryu is “way of harmony” or “way of peace” in Japanese, while Karate-Do means “way of the empty hand”. This meaning of the name signifies that this form was founded in order to serve as a technique to solve problems by following a non-violent approach and without the use of any kinds of weapons. Hironori Ohtsuka Sensei had formulated the techniques of wado ryu karate after he had completed studying the martial art forms of Jiu-jitsu and Shotokan. However, the style which emerged as a result was a more soft style, which used less aggressive methods. It is said that this from of karate is one of the fastest martial art forms which follows the principles of ‘Nagashi and Irimi’. Another important characteristic is that this form has scope for partner-work unlike other karate styles. The style of wado ryu karate is fast and fluid, which involves quick and swift body movements. The students of this form are taught how to keep their mind active and alert and react promptly in any situation in addition with helping them enhance their physical strength and self defense skills. Apart from the training that is provided, the students are required to put in a lot of effort in order to ensure that they maintain good levels of self control, humility and respect for fellow human beings. The main basic techniques that form an integral part of this form of wado ryu karate are blocking, kicking, striking with an open hand, punching, trapping and joint twisting. To differentiate one technique from the other is quite a difficult task when it comes to this style of martial art. Most of the movements involve blocking as well as attacking at the same time. The practitioners are also taught about various body positions which are essential in order to ensure that their body is at a minimal risk of injury. Simplicity is another important part of this style. The practitioners are advised against using unnecessary force, unnecessary techniques as well as unnecessary movements in order to avoid major casualties. There are a few qualities that are a must for a student of wado ryu karate to possess if he intends to master this martial art form. The first and foremost requirement is for the student to have an open mind. He should be open to new techniques and challenges so that he does not limit the scope of his learning and can grasp as much as possible from his teacher. A calm mind is also necessary in order to be able to think and act in every possible situation, so as to make sure that you do not cause any serious injury to the opponent. The theory of the available techniques should be studied carefully and then put to practice in order to excel at this form of self defense. A person who knows how to respect himself as well as his opponent and is successful in maintaining a calm mind throughout is bound to succeed in this style.